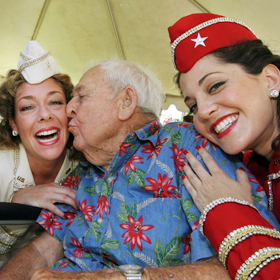 'A HAPPY POST' » Linda Sue Moshier and Heather Lindell, part of the American Belles, dressed in outfits from the 1940s, with retired Army Col. Thomas Wells, 100, to celebrate Fort Shafter's 100th anniversary. Loads on garbage trucks are being underreported, thus cutting into revenue collected. Challenges await that require preparation now, experts warn. The USS Decatur was able to successfully track and destroy a midrange ballistic missile. The original 20th century drawing will be the centerpiece of Hilo Art Museum's Exhibit Center. A daughter gets a wake-up call as she helps her mother deal with food and insulin. It was the second consecutive year the 2004 Olympic silver medalist had pulled out of the U.S. meet. The business, which sells etched glass and crystal products, was started by Frank and Ethel Oda in 1946. Uslan's attorney will argue that filing the case in Arizona was a bid to make his defense more difficult. The president again has vetoed legislation to lift restrictions on embryonic stem cell research.